All users are required to connect with LinkedIn to access their EverTrue account, as we use LinkedIn's standard authentication to validate each user of the platform. * We partnered with LinkedIn as they take user privacy very seriously and rely on the industry standard protocol for authorization, OAuth 2.0 protocol. 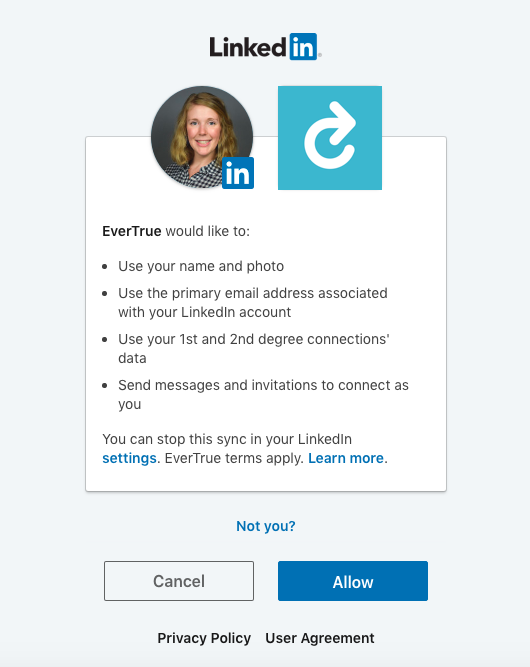 EverTrue uses LinkedIn authentication for basic information only (name, email, and connections) - items 1, 2, and 3 in the screen below - and never access your private information, like messages and invitations - item 4. Item four is a standard part of LinkedIn's authentication screen, but EverTrue does not access your messages or send anything on your behalf. Additionally, EverTrue does not share your data with LinkedIn, Facebook, or any other 3rd party. You can see more here on our Security Overview. *If your institution is using Single Sign-On (SSO) for authentication, you will first be prompted to authenticate into EverTrue using your institution credentials and then will be asked to connect EverTrue to LinkedIn, which activates some of the platform's core features.